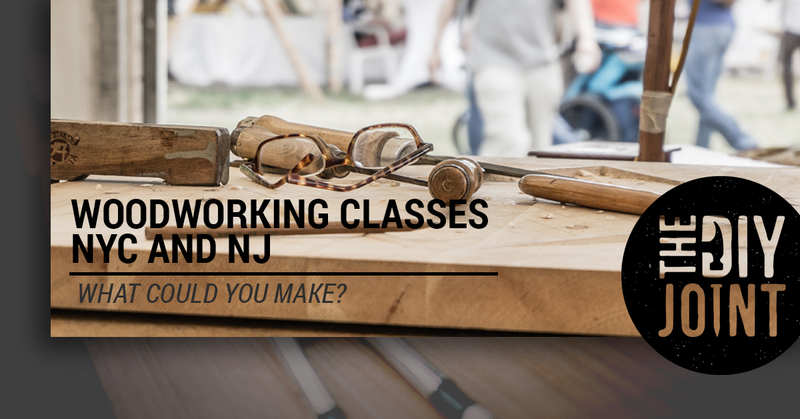 Woodworking Classes NYC And NJ | What Could You Make? The DIY Joint provides people of all abilities and backgrounds with a great opportunity. Taking a woodworking class in NYC, or anywhere really, can open up a new world to whoever takes it. But we’ve created a special space here at The DIY Joint to go beyond teaching you the basics like a shop class. Located in Hoboken NJ, The DIY Joint is a collaboration of makers, comprised of both teachers and learners. Our core mission is to empower everyone who walks through our doors with the skills, tools, and space to make something awesome. But before we talk about what those awesome things in particular might be, we’d like to share with you what sets us apart as a provider of woodworking classes in NJ. You’ll have the opportunity to de-stress, learn new skills that you have ownership of, and express yourself creatively. Beyond that, you really can get in touch with a deeper sense of your identity as a human being. So often we get caught up in the hustle and bustle of our busy, blue light filled lives, that we’ve forgotten an indispensable side of who we are. Working with our hands helps bridge this gap. But creating something meaningful, something we can take home and be proud of, that is something else altogether. And it’s a huge reason why we are growing in popularity for people looking for basic woodworking lessons and joinery courses. Keep in mind, we also offer more advanced courses for the experienced woodworker, which we will get to later on in this post. But for now, read on if you are interested in learning about specific projects that you can sign up for and make with the guidance of an experienced professional by your side. We say that you don’t have to be a master craftsman to make something awesome, and that is absolutely true. We will also tell you that it isn’t about what you make, but it’s about how it makes you feel. We say these things not as some sort of slogan, but because it’s the “why” behind what we are doing. That being said, check out some awesome things that you can make, which in turn will likely you make you feel quite accomplished! We will combine these two classes into one description. With either class, you will learn the essentials of woodworking, which includes milling lumber square to make sure joints fit perfectly with one another. It’s a three week course, in which you’ll learn how to choose good wood from a lumberyard, mill rough wood square, learn how to operate machinery to the point where you can be confident about doing it independently, and more. Such machinery and tools include the table saw, band saw, drill press, and disc sander. For the cutting board class, you’ll get instructions on how to seamlessly glue pieces of wood to one another in order to create your custom look. Once you complete this project, you’ll have access to our open studio for your own personal use. And that is pretty neat! The picture frame class has some crossover to it, but focuses on milling wood into smooth and square pieces. Then you’ll be guided through the process of using the Incra Crosscut Sled in order to cut miter corners out of your wood. By the end of it, you’ll have learned how to cut rabbet grooves on the router table. And just like the cutting board class, completion of this course means you’ll get personal access to the open studio, which again, is pretty neat. This is a five session woodworking workshop at our studio in NJ (right on the edge of West NYC). completing this course will give you an exceptional foundation to get into the world of fine woodworking. You will construct and complete your very own minimalist round side table with a cross base. Through this woodworking course, you’ll get familiar with using major equipment in the studio, more comfortable with milling rough lumber square, and practice more advanced techniques in the realm of precision joinery and gluing approaches. As you may have guessed, if you complete this course, you’ll have access to our open studio for your very own personal use. And throughout time that fact remains exceptionally neat. Glen Guarino is a prominent figure in the world of fine woodworking. Since he was a child, he’s been inspired by the craft. Throughout his career, a hallmark of his work has been the simplicity of his designs which instill a sense of calm to anyone who beholds them. We are lucky enough to have him host our introduction to hand tools class, where students will learn how to craft a mirror with Glenn’s expertise to guide them. In this workshop, you’ll get to learn the theory and technique behind free form carving, utilizing both hand and power tools. No two mirrors will be alike at the end of this class, which means your own creativity and prowess come into play in a big way. This project is challenging and empowering, like all of our courses. It also may require additional time outside of class to complete this woodworking course in NYC. Some of the classes above may not be currently scheduled, or are already happening right now. Other classes, like the “DIY Family” Benc Project, “DIY” Family Candy Dispenser, and “DIY Kids” Summer Camp (wood projects for kids) are all likely to be available again shortly, in some form or another. Space is limited, so make sure you check back frequently to make sure you get the chance to sign yourself or a loved one up. You won’t regret it! Group woodworking projects can be a lot of fun, and make an absolutely fantastic gift idea for a birthday or anniversary. We are happy to work with you to come up with an idea that fits well with your group’s dynamic and interests. Like pretty much all of our classes, we will provide all required tools and materials. We make it easy on you, so all you have to do is show up! Right on the edge of New Jersey and New York City, our loft in Hoboken offers you a chance to get in touch with yourself, develop a worthwhile hobby, and make something awesome with your own two hands. Whether you want to learn to make furniture or are just looking for basic woodworking skills, we’ve got the experience and equipment you need to turn that dream into a reality. Sign up for a class from The DIY Joint today!